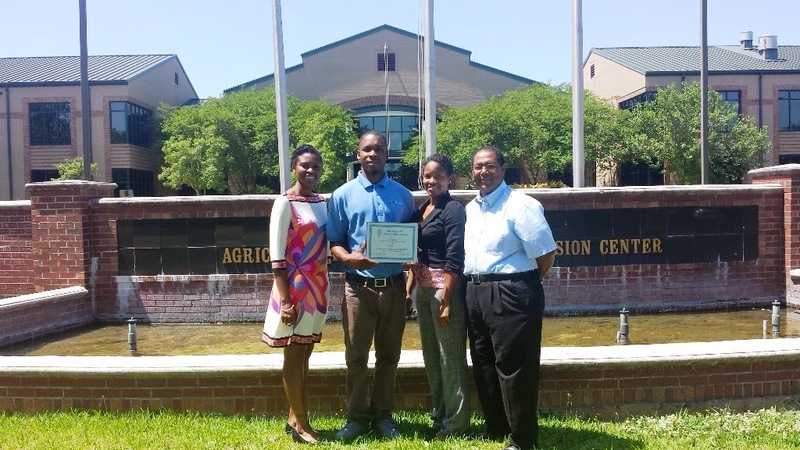 Baton Rouge, LA – In just a couple of weeks, the Southern University Agricultural Research and Extension Center will hold its annual Family and Youth Exposition. From June 12-14, the event, which culminates the past year’s youth development program activities statewide, will bring youth together for a two-day educational, fun-filled experience. The 2014 event will assemble SU Ag Center specialists, agents, and researchers from various parishes for a memorable program with the youth. 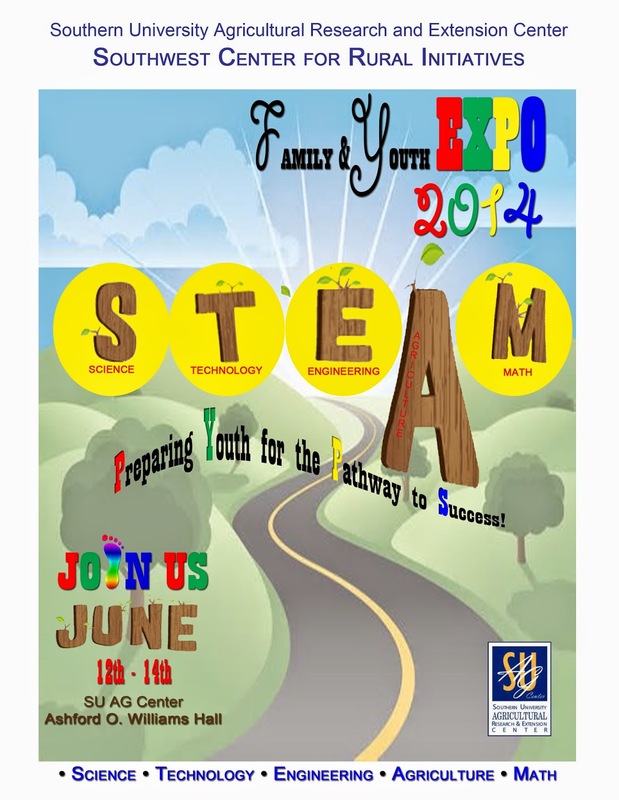 This year’s Expo themed "Full STEAM Ahead," Preparing Youth for the Pathway to Success, will feature exhibits, entertainment, activities, fun and exciting workshops and demonstrations for the whole family. Activates will focus on STEAM: Science, Technology, Engineering, Agriculture, and Mathematics. Youth will arrive in Baton Rouge on Thursday, June 12, get acquainted and enjoy fun activities on the grounds of the Southern University Ag Center in A.O. Williams Hall. They will participate in educational seminars, workshops, illustrated talk, motivational and public speaking on Friday. The event will culminate on Saturday morning with quiz bowl competitions, awards presentation and recognition. For additional information, contact Dr. Wanda Burke at 225/771/2242. 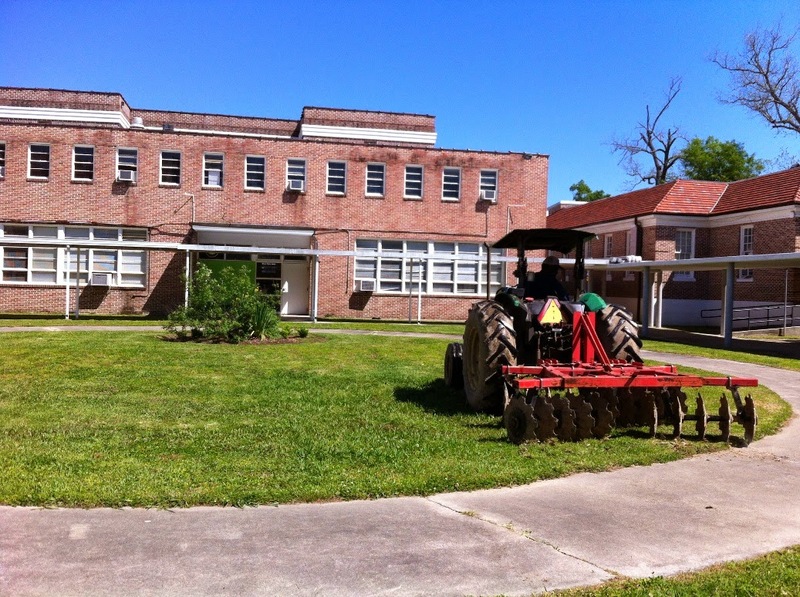 Baton Rouge, LA - Southern University Ag Center is collaborating with the Washington School Board and Washington Career & Technical Education Center on a Joint garden project to beautify the town of Washington in Louisiana. Now, 14 large, square cypress planters, each about four feet wide, three feet tall, and filled with flowering plants and shrubs, line Washington’s main business district. 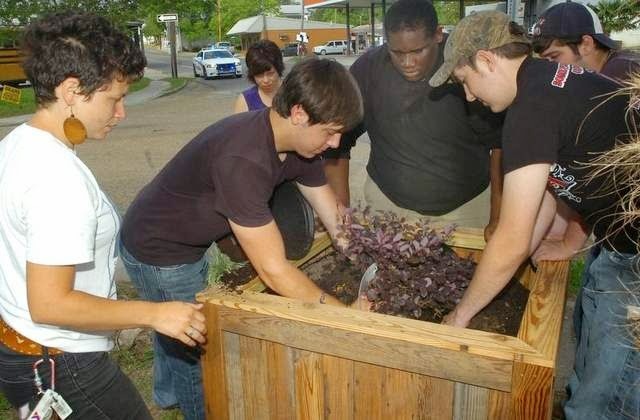 The Washington Career and Technical Education Center students spent the week of May 20, 2014 filling the planters with soil and scores of plants they had grown themselves as part of the beautification effort. “By summer, these will be popping,” said Stephanie Elwood, an extension associate with Southern University’s Agricultural Research and Extension Center. “We have roses, gardenias, witch hazel and many others,” Elwood said. Although the historic town, which depends on tourism, will benefit, WCTEC pro-start teacher Candy Palumbo said it is benefiting the school and its students as well. She said many of the businesses in town don’t even know WCTEC exists. The project is the brainchild of Elwood, who does most of her teaching in Baton Rouge. But she and her husband have a farm in the nearby Plaisance community. “I have ties to this community and wanted to make it look nice,” said Elwood, who headed up an eight-week gardening program at WCTEC this past semester. Palumbo said the greenhouse was initially intended to grow herbs and vegetables for the school’s culinary program, but adding flowers was just a natural extension. Keeping up the planters will also become a part of that program. The project also has generated unexpected side benefits — working in the garden is relaxing and helps relieve stress for many of the students; improving grades and self-esteem in some. Elwood said that is something she has noticed in her own teaching career. “I’ve taught hundreds of kids. They often complain and object, but I’ve yet to come across a kid who puts his hands into soil and doesn’t like it,” Elwood said. The students are marketing the products of the greenhouse at the local farmers market and other venues. “They are learning customer-service skills that will be of value when they transition from school to work,” Palumbo said. Elwood praised Mayor Joseph Pitre and a host of volunteers and others who helped make the project possible. Pitre had a limited budget for beautification but agreed to give the program a try; area businessman Pat Fontenot donated the aged cypress that Washington Alderman Krandall Pijou and school board employee Jack Caine assembled with the help of the students; the St. Landry Parish Waste Disposal District donated the soil. 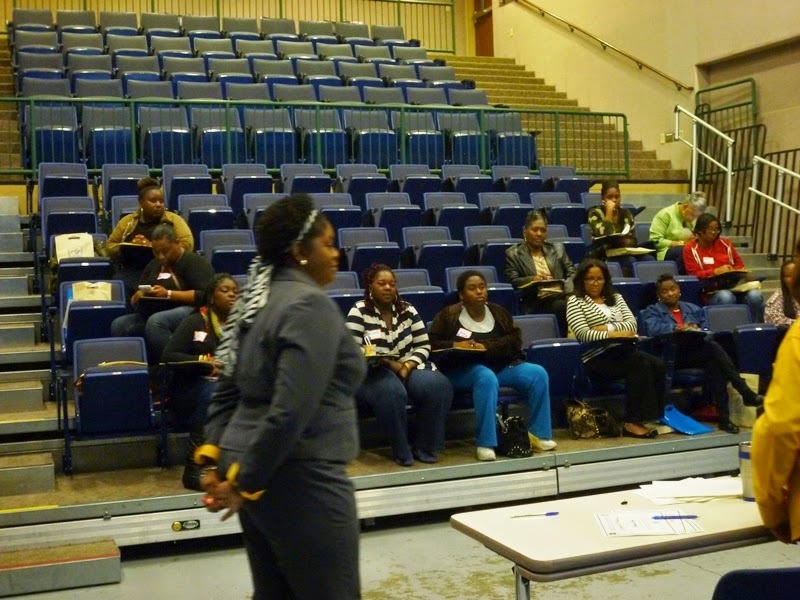 Baton Rouge, LA - The Southern University Agricultural Research and Extension Center, Family and Human Development Department in conjunction with the East Baton Rouge Parish Head Start Program conducted a parenting training entitled “Parenting Techniques for a New Generation” on April 16, 2014, in A. O. Williams Hall. The primary focus of this training which garnered 87 parents was to provide them with preventive skills and strategies that will enable their adoption of recommended nurturing practices and develop healthy lifestyles. Preventing Delinquency, Bullying, & Self Control Tips - Delores Johnson and Milissia John-Baptiste spoke to participants on preventing delinquency and bullying. The session was developed to teach self-control techniques to parents and prepare them to deal with bullying and delinquency situations. Parents were taught to understand bullying behavior, types of bullying and ways to prevent bullying. The session included hands-on activities and a bullying video that received worldwide attention from social media and varies national media outlets. 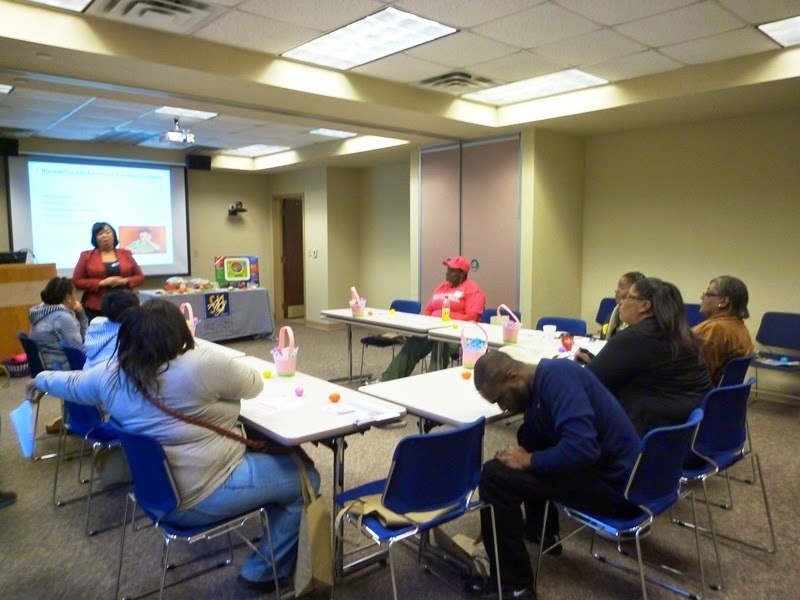 Nutrition & Physical Activity for Children - Marquetta Anderson-Reynolds, and Kiyana Kelly presented on Healthy Eating Habits for Preschoolers. The purpose of this session was to inform parents about the importance of helping their children develop healthy eating habits. The session was designed to teach families about the importance of healthy eating, provide examples of how to prepare healthy meals and snacks, and incorporate 60 minutes of physical activity daily to improve their overall health. Handling Crisis & Emergency Preparedness - Kristin Brandon and Joanie Ledet collaborated with the American Red Cross Organization to help parents increase awareness on the importance of protecting their families at home, while travelling and during a crisis/emergency situation. 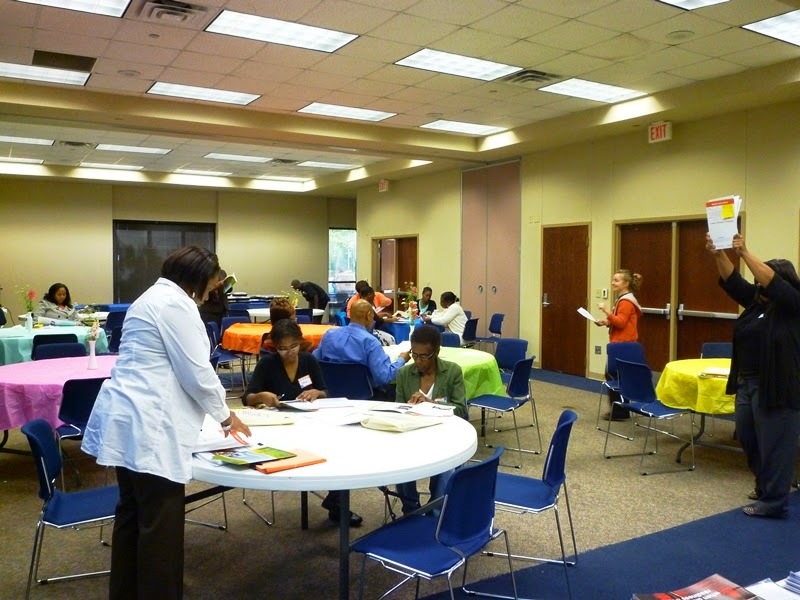 In this session, participants were provided with important information and hands-on activities to encourage positive action to create a family plan, prepare early for a disaster, and build an emergency supply kit. In addition, parents gained knowledge on the significance of immunizations, home safety and guidelines for child passenger safety. In addition to the sessions, several agencies displayed exhibits including LaCHIP, Louisiana Public Broadcasting, American Red Cross, East Baton Rouge Head Start, and SU Ag Center. The agencies’ exhibits offered families and children quick tips on various topics. In the past year, 514 parents participated in the Parents Preparing for Success (PPS) Program which provided basic parenting training and financial/time management training to new mothers. More than 57 participants graduated after completing all six classes at the SU Ag Center. For further information on this or future parenting training, please contact Dr. Kasundra Cyrus at 225-771-2242. Baton Rouge, LA - After the abrupt closure of Jetson Correctional Center for Youth in Baton Rouge, the Ag Fast Track USDA Grant team at SU Ag Center has shifted focus to teaching 6th and 7th grade adjudicated youth at THRIVE School. 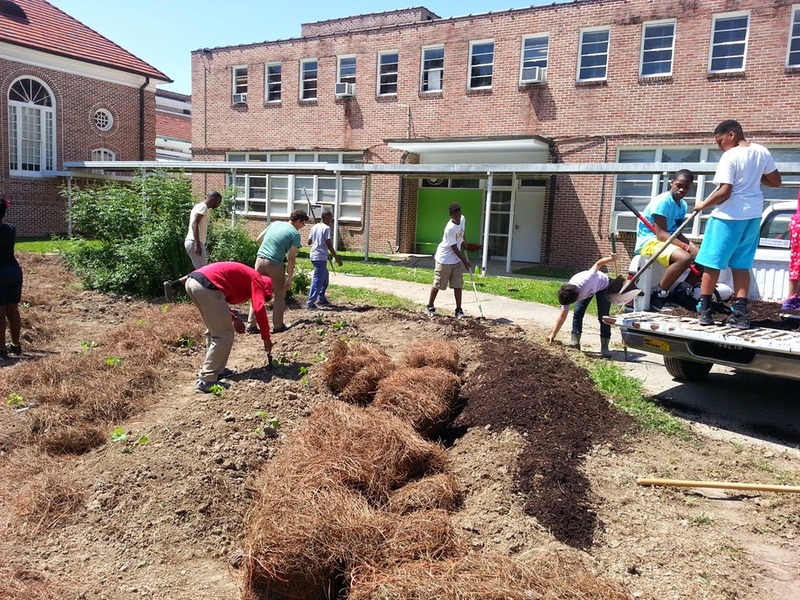 Lessons include agricultural and horticultural skills in implementing a school garden from the ground up. 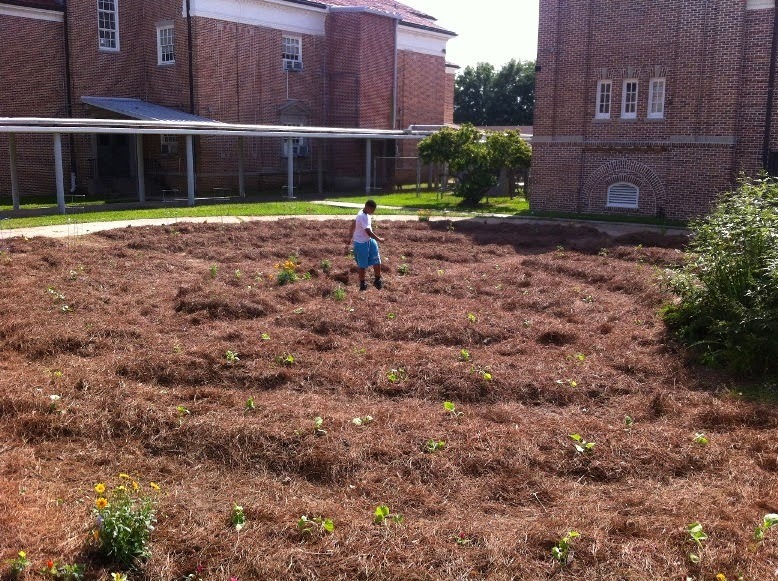 SU Ag Center’s Kevin Belizeard assisted by tilling up a 100 ft. diameter circle on the THRIVE campus and each class shaped the garden rows and planted with vegetable and ornamental seedlings. The grant was originally targeted to youth registered at Jetson Correctional Center. THRIVE is a public, tuition-free, charter boarding school that serves at-risk youth in East Baton Rouge for students in grades 6 through 12. It provides students with an outstanding education in a holistically nurturing family-like residential setting. 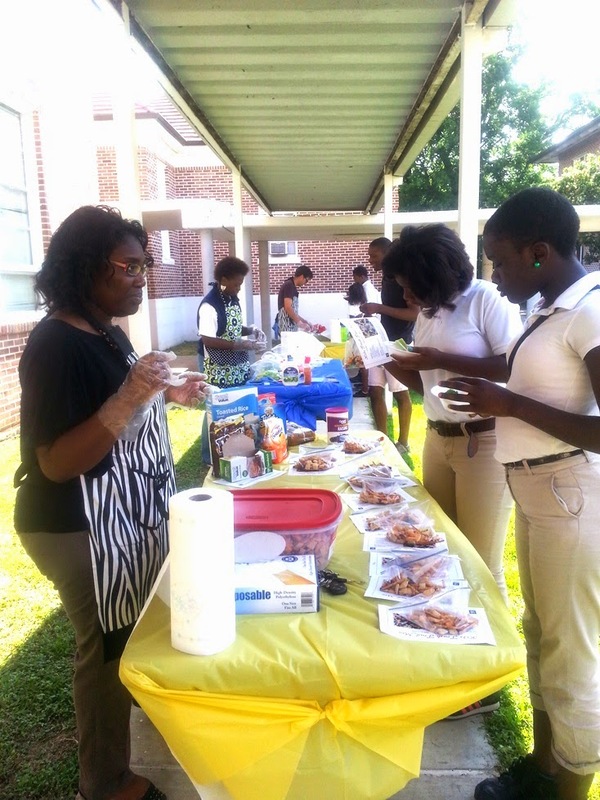 The SU Ag Center team including Joyce Tubbs and Decobea Butler concluded the school year at THRIVE with a Taste Test Field Day. During the event, the students visited five different stations; giving them the opportunity to taste fresh vegetables and fruits, make their own trail mix and fruit smoothies. This experience allowed the students to try new things and see the advantage of planting and growing their own garden. After experiencing the field day and learning the joys of gardening, the students were worried about their garden over the summer. Several workshops will be held at the garden site over the summer for the THRIVE students to attend and nurture the garden planted on campus and in their hearts. The Ag Fast Track USDA Grant Team at SU Ag Center consists of Christie Monroe, Owusu Bandele, Stephanie Elwood, Kelli Hollins and Mila Berhane. Baton Rouge, LA- the Southern University Ag Center and the College of Sciences and Agriculture continue to engage in successful collaborations that increase achievement on both campuses. 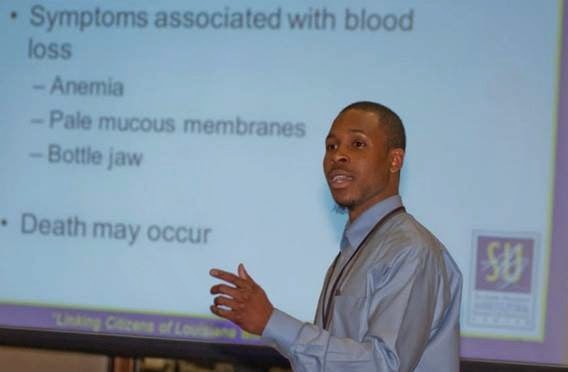 Lamar Burton, a Biology sophomore and Timbuktu scholar at Southern University won second place in the 71st Joint Annual Meeting of the National Institute of Science and the Beta Kappa Chi Scientific Honor Society hosted by Prairie View A & M University in Houston. Mr. Burton made an oral presentation entitled “Mixed Species Grazing of Cattle and Goats on Gastrointestinal Infections of Haemonchus Contortus.” For the past one year, Burton has participated in the Mixed Species Grazing of cattle and goats, collecting data on Gastrointestinal Infections of Haemonchus contortus research project. He is being mentored at the SU Ag Center by Sebhatu Gebrelul, Professor, Animal Science; Renita Marshall, DVM and Associate Professor; and Shonta Manuel, Research Assistant. Haemonchus contortus is also known as red stomach worm, wire worm or barber's pole worm. It is very a common parasite, and one of the most pathogenic nematodes of ruminants such as goat. This parasite is responsible for anemia, bottle jaw, and death of infected sheep and goats, mainly during summer months in warm, humid climates. For further details, contact Dr. Sebhatu Gebrelul at 225-771-2242. 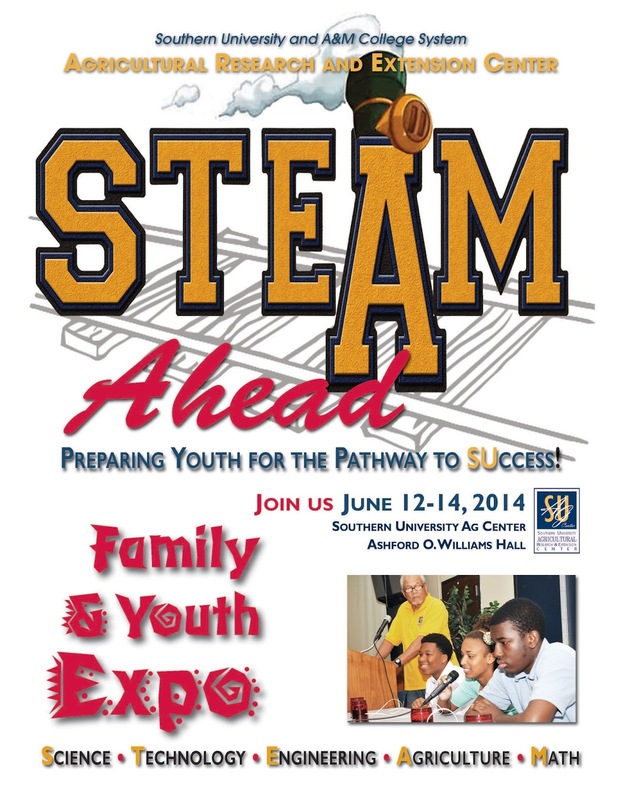 Baton Rouge, LA - The Southern University Ag Center will hold its annual Family and Youth Exposition from June 12-14. The event, which culminates the 2013 youth development program activities statewide, brings youth together for a two-day educational, fun-filled experience. The 2014 event will assemble SU Ag Center specialists, agents, and researchers from various parishes for a memorable program. Youth will arrive on Thursday, June 12, get acquainted and enjoy fun activities on the grounds of the Southern University Ag Center in A.O. Williams Hall. They will participate in educational seminars, workshops, illustrated talk, motivational and public speaking on Friday. The event will culminate on Saturday morning with quiz bowl competitions, awards presentation and recognitions. 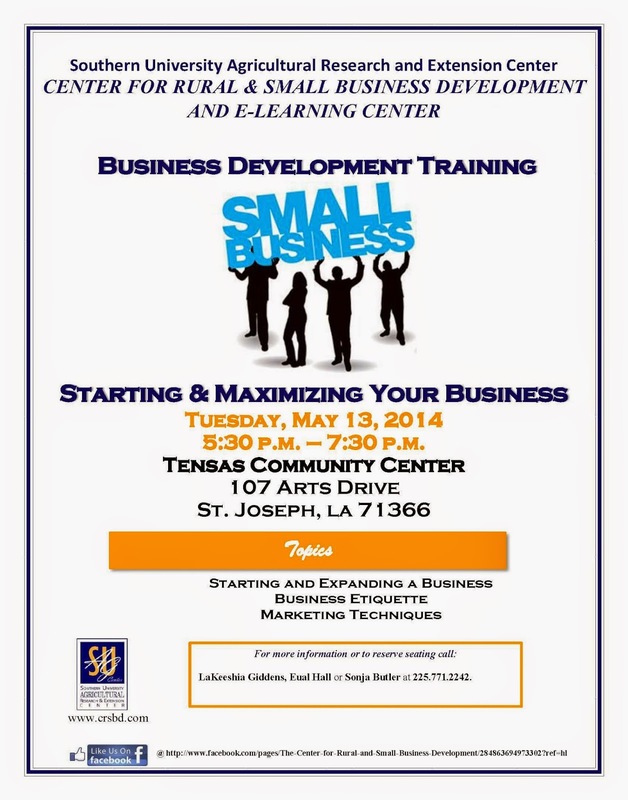 Baton Rouge, La - The Center for Rural and Small Business Development in the Southern University Agricultural Research and Extension Center will hold a free business development training entitled “Starting and Maximizing Your Business,” on Tuesday, May 13, from 5:30 p.m. to 7:30 p.m. at the Tensas Community Center, 107 Arts Drive, in St. Joseph, La. This free seminar is open to all current and potential small business owners, and will teach individuals how to start or expand an existing business, provide business etiquette information and marketing techniques to help promote a business. For additional information or to reserve seating, contact LaKeeshia Giddens, Eual Hall or Sonja Butler at 225.771.2242.